Some facilities require service above and beyond standard evening hours, and ServiceMaster Building Maintenance can make certain that your facility is maintained at the time that is convenient for you. 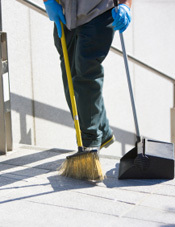 We can coordinate daytime sanitization services, daytime janitorial services during regular office hours, or touch up and common area cleaning to complement an evening service. For high density, high traffic areas, daytime services can help maintain facilities throughout the workday. Companies also look to Dayporter Services as an opportunity to reduce energy costs by having cleaning staff in the facility during daytime hours.